Will Grady already had made one trip around Memorial Hospital’s rehab center with his orange walker, so the 9-year-old was ready to stop and give it a rest. Physical therapy assistant Peggy Heise had other ideas. “Ten more. Ten more. Ten more,” she repeated. “Yes, sergeant!” Will shot back. The exchange brought a smile to mom Sarah Grady’s face. She was watching from the sidelines, thrilled with improvements in her son’s stride. Will has cerebral palsy, a neurological disorder that affects body movement and muscle coordination. “At the end, Peggy always says, ‘I know I’m hard on you, but you know why I’m doing it, and I’m really proud of you,’” said Sarah, 42, of Belleville. Will has worked six years with Peggy and her sister, Maria Matthews, an occupational therapy assistant who focuses on life skills such as eating and writing. Will’s mother describes the results as “miraculous.” He has gotten stronger physically and developed a more positive attitude. Peggy, 54, and Maria, 51, of Maryville, grew up in a family of 13. Both became therapists in the ’90s after rearing families and returning to college. Peggy has six children, and Maria has two. Three years ago, Sarah recommended the sisters to her friend, Tiffany Whitten, whose 14-year-old son, Tony, also has cerebral palsy. He had undergone therapy elsewhere and hated it. Tony hit it off with Peggy and Maria, who helped him see his potential and gain self-confidence. Insurance limits later required him to drop occupational therapy, but he’s working toward his goal of walking independently, ditching his cane and metallic-blue walker. “Peggy pushes me — sometimes over the edge,” he joked. Perhaps just as important as the therapists is the relationship that has developed between the two boys. Tony has become a role model. Sometimes he shows up early for therapy just to encourage Will, who seems to try a little harder when his friend is watching. Will was born prematurely at 23 weeks, weighing 1 pound, 6 ounces. His type of cerebral palsy is known as spastic diplegia, which causes extreme muscle tightness. The fourth-grader at Abraham Lincoln School is trying to make the transition from wheelchair to walker. Like Tony, he hopes to eventually go it alone. “It’s important to me because I want to do stuff with my brothers and my friends,” he said. 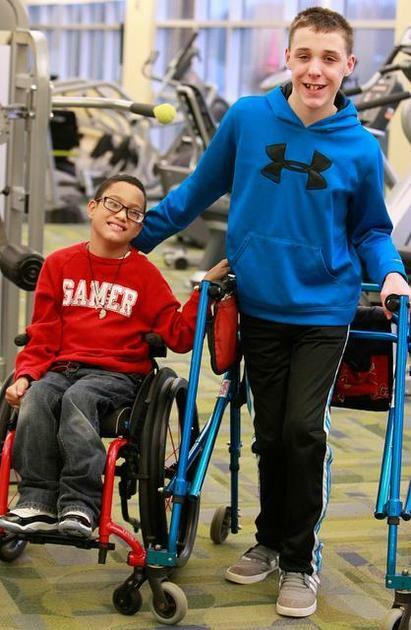 Like many people with cerebral palsy, Will has undergone multiple surgeries. Two years ago, doctors operated on his knees. Maria visited him in the hospital and even went to his school to show staff how to transport him as safely and painlessly as possible. “She did it on her own time during her lunch hour,” Sarah said. Will underwent another surgery in June, this one on his spinal cord. Peggy guides him through strengthening exercises such as climbing stairs, crawling and rolling over in bed. Maria works on balance with aquatics and coordination with basketball drills. Through it all, Will is known for cracking jokes and laughing at himself. “He does have a very big personality,” Peggy said. Tony also was born prematurely, weighing 1 pound, 11 ounces. He’s an eighth-grader at West Junior High School. He is very articulate when it comes to describing the affect cerebral palsy has on his body. Peggy’s first step in treating Tony was sitting down for a chat. He told her he didn’t want therapy. She asked him why. Then she listened. Before long, Tony was helping Peggy set goals and figure out how to reach them.